For anyone following the tragic story of Gough Island, you’ll know that the island’s unique seabirds are in a dramatic decline and that predation from invasive non-native mice is the primary cause. But until now we haven’t known the true extent of the damage mice are causing. Below, my colleague Laura Beasley reports on new research highlighting the scale of mouse predation on seabirds. 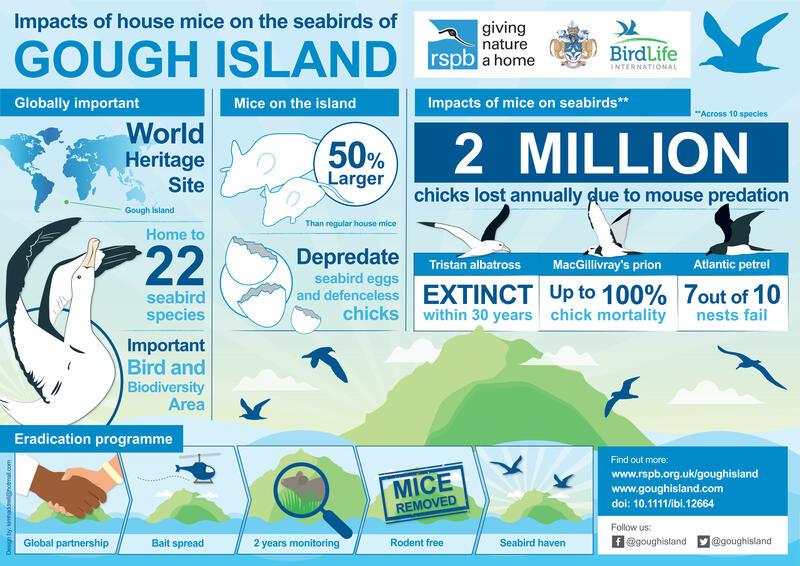 A new study by our colleagues at universities in the UK, the Republic of Ireland and South Africa has been published today measuring the number of seabirds killed by mice on Gough Island every year. On first look, Gough Island is an idyllic uninhabited UK Overseas Territory in the South Atlantic. The World Heritage Site is home to 22 stunning nesting seabird species: a birders' paradise. But look closer and you’ll see a heart-breaking story unfold. Since mice were brought to and populated the island, seabirds have become their prey. With no natural defences against mice, chicks endure horrific attacks for up to three nights in a row before they succumb to their injuries. And it’s no surprise then that numbers of seabirds are plummeting; for example as few as 14% of Tristan albatross chicks are surviving to fledge each year. The situation is only escalating, mice have now been observed scalping the chicks and this year, for the first time on Gough, an adult Tristan albatross was found dead from the wounds of mice attacks. Sailing up to Gough Island in the South Atlantic – 2,600km from Cape Town (G. Rosin). Previous estimates of the number of seabirds lost to mouse predation each year have suggested one million. By comparing breeding success of species on Gough to comparable species on a predator-free island this new study shows the true number to be much higher. In fact, we’re losing almost two million of Gough’s seabirds each year because of mice. The study found that those species whose chicks fledge latest in the winter, when there is less food available on Gough, are the worst affected by mice. That includes small burrowing petrels such as the Atlantic petrel, the recently discovered McGillivray’s prion, and winter-breeding birds such as the iconic Tristan albatross. Many more species could not be quantified in this study due to their now scarcity on Gough, strongly suggesting the number of birds lost to mice could easily exceed three million annually. But we have a plan to stop this through The Gough Island Restoration Programme. In one of our most ambitious projects to date we’ll eradicate the mice, save species from extinction and restore Gough to the seabird haven it once was. The shocking results of this latest study are a reminder of why we’ve taken on this challenge, and the scale of impact it could have. The value of island restoration projects is becoming better understood all the time, with recent successes on the Antipodes Island and South Georgia making headlines. The return on investment in these projects cannot be underestimated. With our partners the Tristan da Cunha Government, the Department for Environmental Affairs, BirdLife South Africa and Island Conservation, we established the Gough Island Restoration Programme in 2015. The team are feeling shocked at these figures, but it’s mixed with the heightened sense of the projects’ conservation value and the responsibility on our shoulders. We now know that after years of planning this three-month operation could save two million seabirds each year and prevent the extinction of a number of species. This project is bold, ambitious and, if successful, will save the Critically Endangered native Tristan albatross from extinction; having a major global conservation impact. It is safe to say that The Gough Island Restoration Programme encapsulates what the RSPB is all about. The heart-wrenching moment a MacGillivray’s prion returned to its nest to find its chick dead – eaten alive by invasive non-native mice (Jaimie Cleeland). This is one of the largest projects the RSPB has ever undertaken, and we need your support to make it a success and put an end to this horror. You can donate directly to the project, and help save Critically Endangered species from extinction. And if you have five minutes today, please read this powerful blog from one our 2017/18 Field Assistants. It may be hard to face the reality of this environmental catastrophe, but there is a solution that you can help us to realise. The endemic and Critically Endangered Tristan albatross population has declined by 96% in three generations (Jaimie Cleeland). The study was carried out by staff at University College Cork, Ireland; Queen’s University Belfast, UK; The RSPB, UK; Conservation Solutions, UK; University of Cape Town, South Africa; Stellenbosch University, South Africa; and The Natural History Museum, UK. The Gough Island Restoration Programme is being carried out by the RSPB in partnership with Tristan da Cunha, BirdLife South Africa, the Department of Environmental Affairs in South Africa, Island Conservation, BirdLife International, the Percy Fitzpatrick Institute, the Zoological Society of London, the World Land Trust, the Royal Zoological Society of London, the Durrell Institute and the Rothschild Foundation. The programme is part-funded by the RSPB, the UK government, the National Fish and Wildlife Foundation, The David and Lucile Packard Foundation, John Ellerman Foundation, Ludwick Family Foundation, Jephcott Charitable Trust and other generous individuals and organisations. Be interesting to see what would happen in the absence of intervention - as with a natural arrival of a new predator. Some of the mice would turn cannibal presumably, when the birds became rare enough, or they would die out in their turn. Much better to try to eradicate them though! What a really great project by the RSPB. It is so vitally important. One can only wish the participants the very best of luck with it and “hats off” to the RSPB yet again.